On-location filming for the upcoming action-thriller The Foreigner, starring Jackie Chan (成龙) and Pierce Brosnan, was so realistic that pedestrians were genuinely frightened. 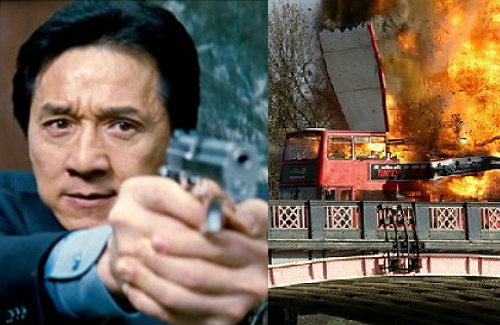 The scenes, which were shot in London, featured the explosion of an iconic red London bus on the Lambeth Bridge across the River Thames. The special effects were so realistic that both London residents and tourists who were nearby mistook the scene for a terrorist attack, and broke into mass panic. An eyewitness described seeing the bridge in flames, while the bus exploded into pieces that scattered all over the river. In response, the production team explained that prior to filming, they had issued notices to all nearby residents and put up warning signs and distributed information brochures. The affected residents were, however, not satisfied with the way the situation was handled, and filed a complaint with the relevant city council authorities. Their main argument was that there was a lack of publicity regarding the filming of the scene, and that it had thus stirred up feelings of trauma associated with the 2005 London bombings. He still has his fans. No need for JC to retire yet. @anon Yes. Nobody gives a damn about this old fart who is a totally irresponsible father and husband. He should just disappear from the scene and he won’t be missed I’m pretty sure of that. A sizeable percentage of HK men account for poor father and husband material. Fire them all! I thought he said no more action movies after “Chinese Zodiac 12”. How many more have we seen him in since? I am a big fan of his martial arts choreography but not of his acting or singing. Maybe he can do what Sammo Hung does, be a martial arts choreographer or producer, and then guest star instead of being male lead. As for the explosion, I do agree that they should have publicise the intent to film earlier. With all the terrorist attacks that have been happening lately, everyone is on edge and they need to be careful not to start a mass panic attack. You never know if someone will think it is real and have a heart attack and die or have a mental breakdown. I really don’t understand how the pedestrians didn’t know it’s filming. Wouldn’t there be a lot of cameras and production crews around? I think people are trying to create a buzz for the movie. I believe roads were closed and authorities have been notified. They even had the fire brigade on stand by in the event something went wrong. If pedestrians were to see an explosion, they must be a long way away. I don’t see many British people complaining about it here.